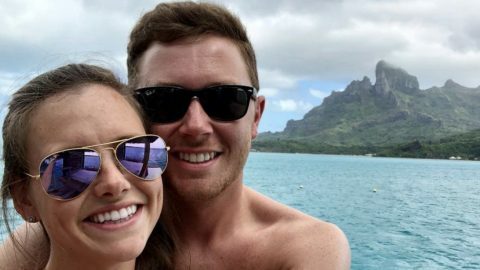 Just one week ago, American Idol champion Scotty McCreery wed his girlfriend of 6 years, Gabi Dugal. Scotty took a moment out of his honeymoon this past week to share some advice for anyone out there looking for their special someone. McCreery and Dugal wed on Saturday (June 16) in a stunning outdoor ceremony in the North Carolina mountains. Scotty’s childhood pastor officiated as more than 200 friends and family witnessed the exchange of vows. The pair set off to tropical Bora Bora after the wedding. There’s been no shortage of photos and videos from their romantic getaway and the couple appear to be enjoying every moment of their first week of marriage. To keep up with the new bride and groom, follow them on social media here and here.